On Friday I took my daughter, Emily and her friend, Jed, to the top of Ingleborough from Clapham, one of the best walks in Britain and the finest introduction to limestone country. Many climb the mountain by the Three Peaks route and miss all the exposed positions that make this place so memorable. 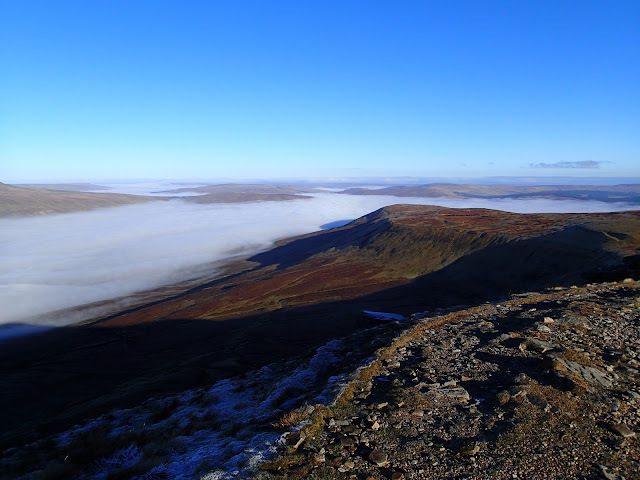 It's worth wandering off the summit plateau to get a real sense of the height: not the highest in the country by a long way, but brilliantly positioned on the edge of the Pennines with a long plain beyond stretching to the Irish Sea. The famous stepped profile, which can be seen from as far as fifty miles away. Here the great bulk of the mountain looms as we make our way up from the summit of Little Ingleborough. 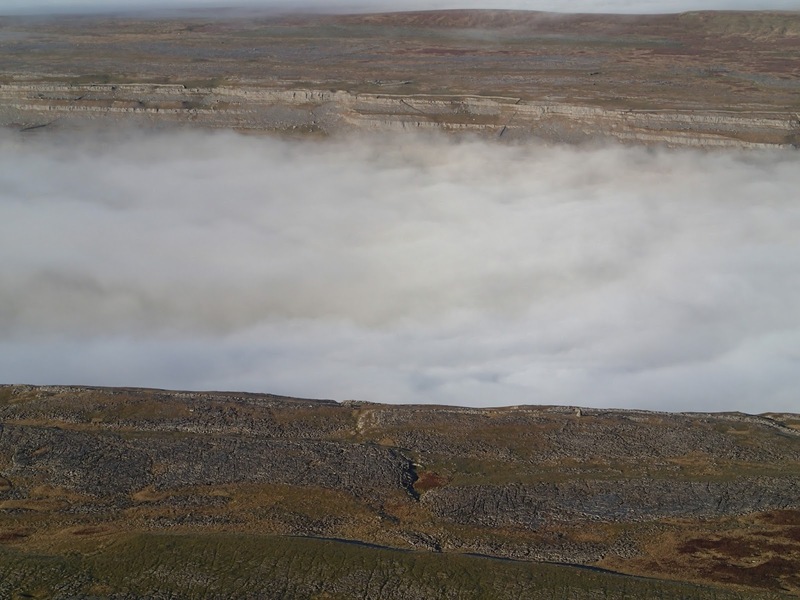 Two obvious terraces are seen below the summit, the lowest being above a sandstone cliff, while the upper terrace, marked by the famous spur of rock that gives such a memorable profile, is of Main Limestone, the highest limestone anywhere on Ingleborough. Close-up of the 'saddle' where the cap of Grassington Grit (Millstone Grit) tumbles down to the spur of Main Limestone on the left. This spur, of course, can be seen from the north, marking the limestone cliffs above Black Shiver. We wanted to stand on top of these for a great view down the central gully. Jed on a huge boulder of gritstone that has tumbled down onto the Main Limestone terrace from the summit plateau. Emily on the same boulder, as seen from the scramble down the Black Shiver gully. Columns of Main Limestone lie beneath her, formed when sea levels rose sufficiently for life to be productive during the late Carboniferous period. Very thin beds of shale (mudstone) sandwich layers of sandstone in the Yoredale series, all caused by fluctuating sea levels. There are even very thin seams of coal on Ingleborough, formed when swampy conditions allowed vegetation to flourish. Exposed and very fractured columns of sandstone above the Black Shiver, at the exact location of the red spot from the earlier picture. The massive plinth of Great Scar Limestone lies hundreds of feet below, with the green floor of Chapel-le-Dale over 1000 feet beneath the camera! Close-up of the sandstone outcrop. Test it before you stand on it! That'll do ... stop right there ... notice the great rift of Meregill on the plateau below. This brilliant shot by John Cordingley shows cloud filling the great valley of Chapel-le-Dale; the same valley that can be seen beyond Jed in the photograph above. Imagine the cloud to be a sea of ice ... and you get an accurate idea of what the landscape looked like some 13, 000 years ago, at the end of the most recent glaciation: the Devensian. The glacier moved from right to left (north to south) across the image. Another great view of 'glaciers' represented by clouds - this time giving an idea of how the main ice flow split into two 'branches' at Ribblehead, just north of Park Fell - seen in the centre of the image. The branch on the left is moving towards the camera, scouring out the 'u' shaped valley of Chapel-le-Dale, with the right branch flowing down Ribblesdale. The amazing view down the gully to the Black Shiver landslip, one of two major landslips on Ingleborough. Sandstone outcrops with pavements of white limestone hundreds of feet below. The author's weight is considerably more than Jed's. That rock isn't going anywhere! You don't forget experiences like this. Even at the base of the cliff, the land plunges away in a sheer drop to the plateau. Ingleborough certainly packs a punch. Discerning explorers requiring comfort for a sandwich might like to look for this lovely little sofa of turf-covered rock, with a huge drop over which to dangle your feet. Jed on top of the Main Limestone, with the Great Scar Limestone showing as wave of white, far below. Emily wasn't for the scrambling down, but she still made a great picture! The route to the rocks above Black Shiver is seen easily on the aerial views included in my previous Ingleborough posts. Take great care ..... and take a camera. Rather than heading straight for the summit there are some great pointers to look out for on the way up. Shopping in Manchester just doesn't quite match this experience does it? Know which I'd prefer and it has nothing to do with shopping anywhere. Your blog has taught my family and I so much more about the area our family originated from, thank you.